It's no secret that an upcoming Windows update codenamed 'Threshold' will herald the return of the Start menu and allow Metro apps to operate in windowed mode. Heck, the image above came straight from Microsoft itself. But whenever fresh screenshots of the interface show up it's always worth taking a look. Myce.com recently nabbed two screenshots from a purported recent build of Threshold, which is expected to be called Windows 9 when it debuts in 2015. Right now, however, these internal builds are labeled Windows 8.1 Pro—a fact that Neowin noted earlier in July when it also nabbed a screenshot of the Start menu. Presumably, as with the original versions of the Start menu, you'll be able to pin apps to this list. To the right of the apps list is an area with pinned metro apps for easy access and at-a-glance live tiles for apps like weather, mail, news, and calendar. The new Start menu seems to be customizable, with it tile sizes appearing adjustable, just as they are now on the Start screen. The Start Menu build leaked on the My Digital Life forums and reported by Neowin. One difference from the April sneak peek is that regular desktop features are also pinned to the metro side. Both the Myce and Neowin screenshots, for example, show icons for the Pictures and Documents folders, as well as what looks like a "My PC/This PC" tile. Most desktop users are excited about the notion that the Start menu will return. Even better it may actually put metro apps to good use for those of us who boot to the desktop. But Microsoft may have different plans. The Verge reported late Monday that Microsoft is testing versions of the Start menu that take over the entire screen and act more like the current Start screen in Windows 8.1 (while also confirming Myce's screenshots as legit, according to its sources). What The Verge doesn't mention, however, is whether this will happen on all devices running Threshold. A report from Windows watcher Paul Thurrott earlier in July said the expanded Start menu would be the default option for tablets and other touch-based devices that lack a keyboard. This interface, Thurrott said, would be "a full-screen Start menu that looks and works a lot like the Start screen does now." 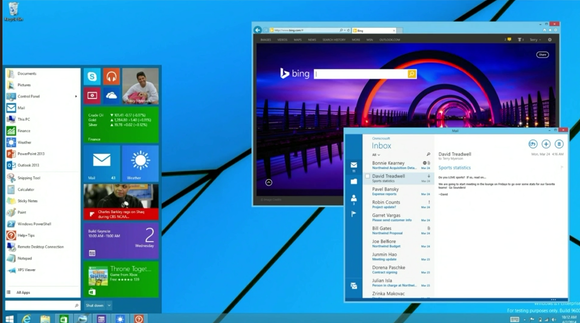 Regular PCs, however, would get the more traditional Start menu as seen in the Myce and Neowin leaked screenshots. In addition to another look at the Start menu, Myce also published a screenshot showing the Windows Store operating in windowed mode. The Windows Store Metro app running in a desktop window.